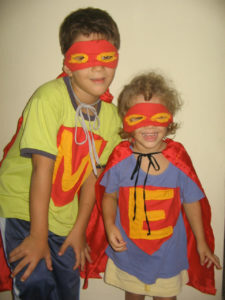 Above: Marcos and Elsa wearing the superhero costumes I made for them. 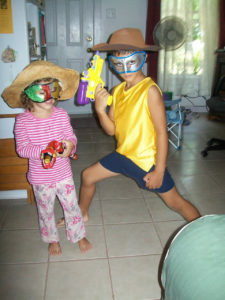 My kids have always loved dressing up. 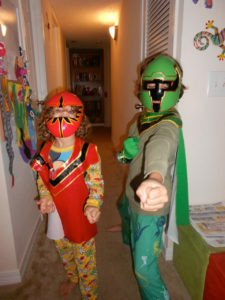 Especially as superheros. 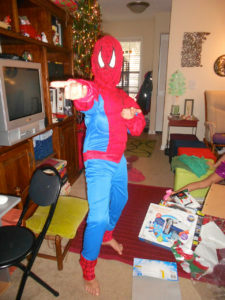 Spiderman was my son’s favorite. 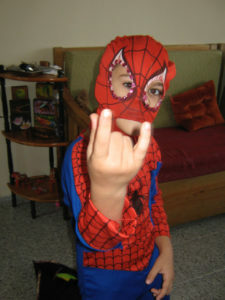 Marcos as Spiderman on his 4th birthday. 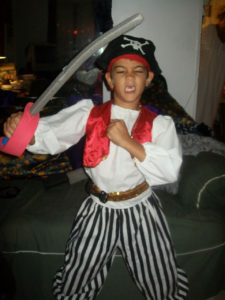 Marcos a little older now. the eye holes have now been embellished with sequins. 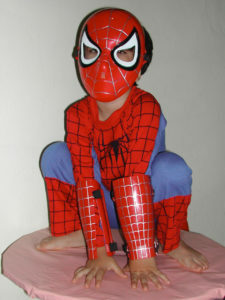 Even older with yet another Spiderman costume. 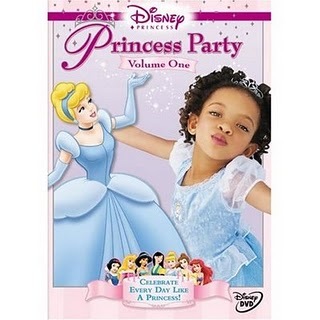 Elsa was a little small but had to get in the act. 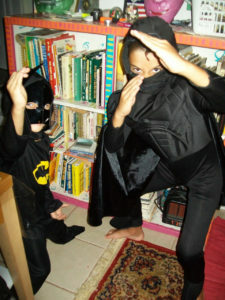 My kids, my son especially, always loved superheroes. 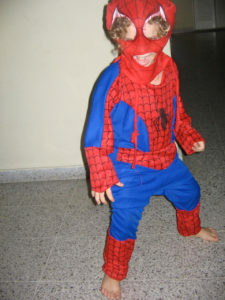 Spiderman was his favorite and still is. 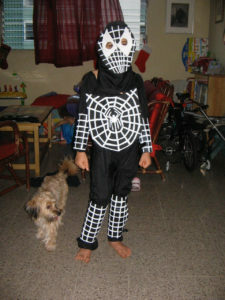 We had many Spiderman costumes over the years. 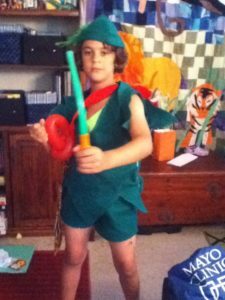 I always encouraged costumes because for me it was creative play and that was always a good thing. 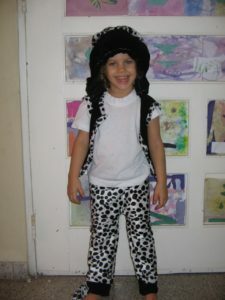 So I started making costumes for the kids for Christmas gifts. In the Dominican Republic, Halloween wasn’t really celebrated so Christmas was the time I’d give them. I made so many different costumes that my Dominican friends wondered if costumes were a traditional Christmas gift in the United States. 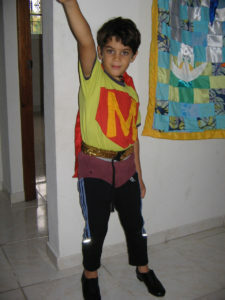 Marcos’ first home made costume. 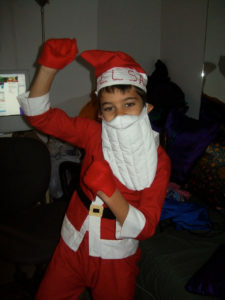 Marcos a little older but still playing Santa — see how short the sleeves are? 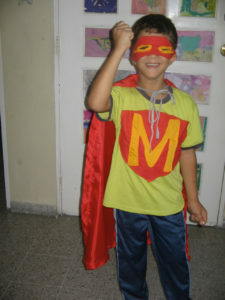 Even when Marcos could no longer fit in the Santa costume, he still played with it but Elsa wore it. 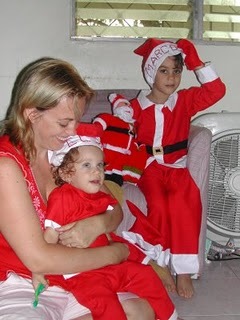 The first costume I made was Santa Claus for my son, complete with Santa doll, and a Santa had for my daughter. 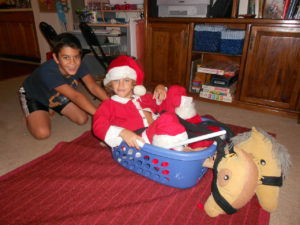 My son idolized Santa like a super hero but my daughter was too young to care. 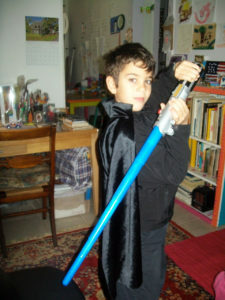 Other costumes followed. 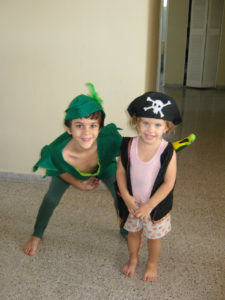 I made Peter Pan for Marcos and A kitty cat costume for Elsa which was a hat with ears, a vest and pants with a tail.. She soon grew out of but continued to play with none the less. Elsa is modeling a pirate costume I made. Elsa as a kitty cat. 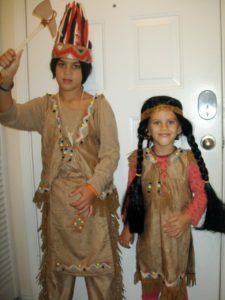 In Native American costumes I made — please no ‘cultural appropriation’ comments as I did this with love and respect. 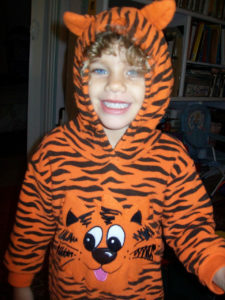 Store bought costumes were still popular and the kids enjoyed mixing and matching different ones so we always had plenty of those on hand. Hmm, not sure that they are trying to be here. 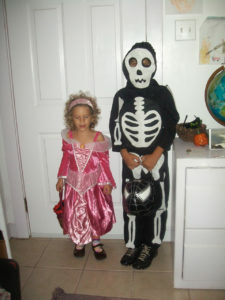 So clearly my kids had fun dressing up. 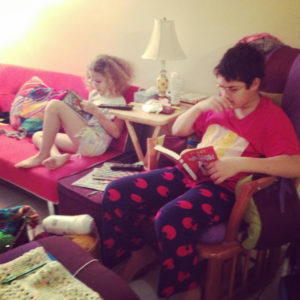 But things have not always gone as smoothly as I would like for my kids. 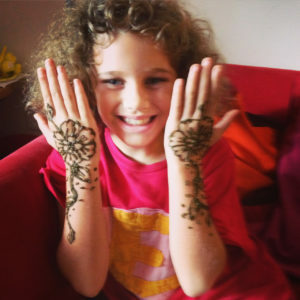 Born overseas, their birth father left when my son was 4 and my daughter just 2. 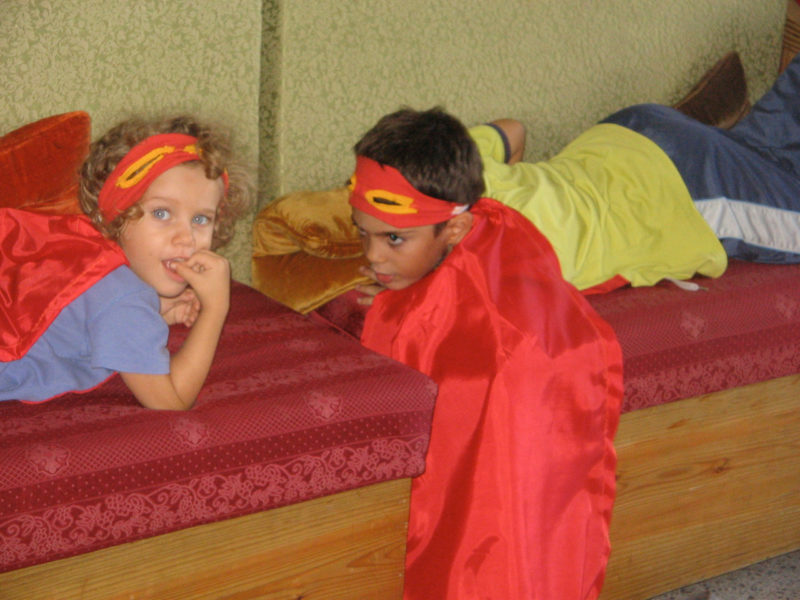 We were living in the Dominican Republic and as I healed from my own hurt, I also looked for ways to heal them. As always, I turned to my creativity. 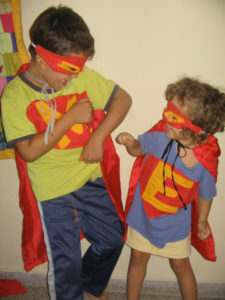 So when their father left us and we did not have family support, I decided to give each kid a personalized superhero costume. 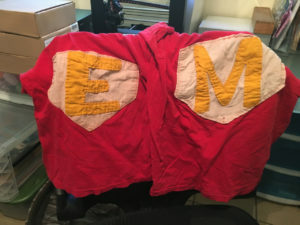 In the style of Superman, Marcos had a giant M on a shield and Elsa a giant E. The first versions came with a cape and a mask. 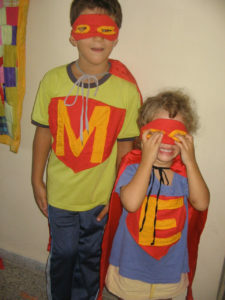 I made them because I wanted to tell them that they too were superheroes, at least to me and that even though times were tough they were going to get through it. 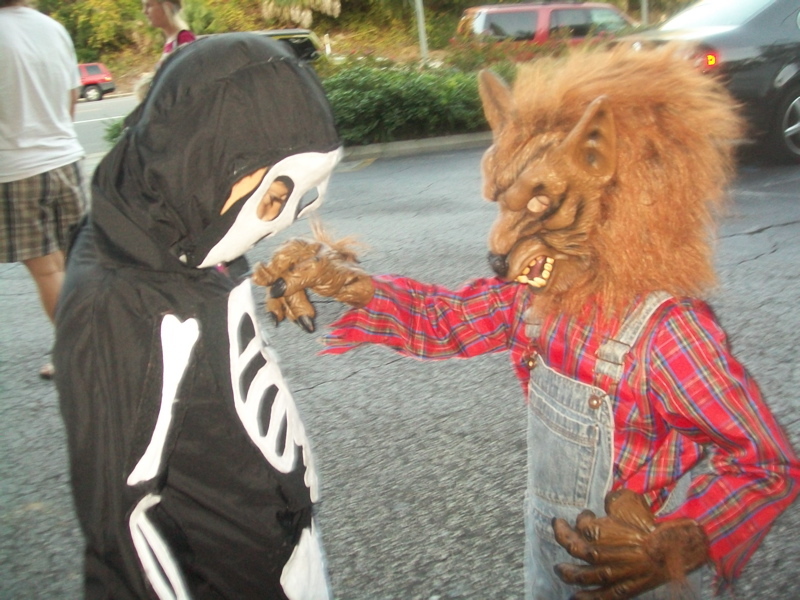 The costumes were a hit. So those shirts lifted their spirits and soon the capes and masks were abandoned but the shirts remained popular as sleep shirts. 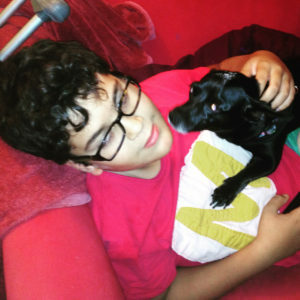 They came with us when the kids and I moved back to the United States. With time, as to be expected, the shirts got too small so I was going to put them in the giveaway when both kids strongly protested. “No! We love those.” they said, “Can’t you just put them on bigger shirts?” So that is what I did. The first shirts where blue and green because it was whatever I had on hand but when I sewed them on to new shirts I made them both red. They wore them all the time. 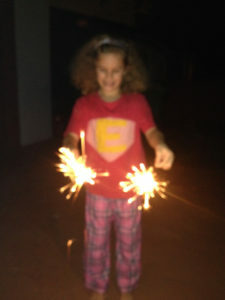 Here are different pictures showing them in the shirts. The second set of shirts that they have now outgrown. The new shirts ready to be slept in. So now the time has come once again for me to put them on bigger shirts. As you can see the “red” of the emblem has faded to almost white and the “yellow” is quite pale but still readable. Little did I know that these shirts that I made to boost their self esteem would be such a long lasting favorite. 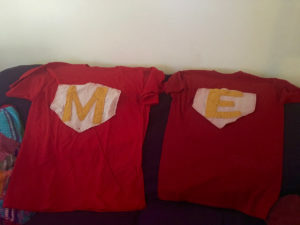 So when I finish this post I will sew the faded but loved emblems on new shirts to be treasured once again. 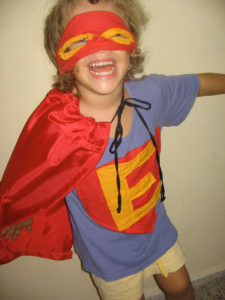 May we all be superheroes in one form or another!